In 1869, a golden spike linked the Central Pacific Railroad and the Union Pacific Railroad at Promontory, Utah. The development of railroads was one of the most important phenomena of the Industrial Revolution. With their formation, construction and operation, they brought profound social, economic and political change to a country only 50 years old. Over the next 50 years, America would come to see magnificent bridges and other structures on which trains would run, awesome depots, ruthless rail magnates and the majesty of rail locomotives crossing the country. The railroad was first developed in Great Britain. A man named George Stephenson successfully applied the steam technology of the day and created the world's first successful locomotive. The first engines used in the United States were purchased from the Stephenson Works in England. Even rails were largely imported from England until the Civil War. Americans who had visited England to see new steam locomotives were impressed that railroads dropped the cost of shipping by carriage by 60-70%. This stereograph of the Central Pacific Railroad would have appeared three-dimensional when viewed through special glasses. Baltimore, the third largest city in the nation in 1827, had not invested in a canal. Yet, Baltimore was 200 miles closer to the frontier than New York and soon recognized that the development of a railway could make the city more competitive with New York and the Erie Canal in transporting people and goods to the West. The result was the Baltimore and Ohio Railroad, the first railroad chartered in the United States. There were great parades on the day the construction started. On July 4, 1828, the first spadeful of earth was turned over by the last surviving signer of the Declaration of Independence, 91-year-old Charles Carroll. New railroads came swiftly. In 1830, the South Carolina Canal and Rail-Road Company was formed to draw trade from the interior of the state. It had a steam locomotive built at the West Point Foundry in New York City, called The Best Friend of Charleston, the first steam locomotive to be built for sale in the United States. A year later, the Mohawk & Hudson railroad reduced a 40-mile wandering canal trip that took all day to accomplish to a 17-mile trip that took less than an hour. Its first steam engine was named the DeWitt Clinton after the builder of the Erie Canal. Although the first railroads were successful, attempts to finance new ones originally failed as opposition was mounted by turnpike operators, canal companies, stagecoach companies and those who drove wagons. Opposition was mounted, in many cases, by tavern owners and innkeepers whose businesses were threatened. Sometimes opposition turned to violence. Religious leaders decried trains as sacriligious. But the economic benefits of the railroad soon won over the skeptics. 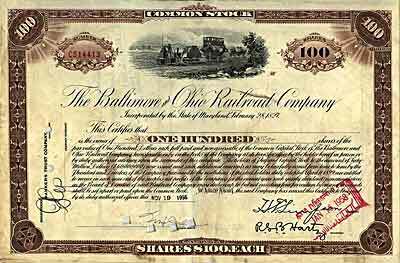 Shares were sold to fund the construction of the B&O Railroad. In only 12 days, the company had raised over $4,000,000. Perhaps the greatest physical feat of 19th century America was the creation of the transcontinental railroad. Two railroads, the Central Pacific starting in San Francisco and a new railroad, the Union Pacific, starting in Omaha, Nebraska, would build the rail-line. Huge forces of immigrants, mainly Irish for the Union Pacific and Chinese for the Central Pacific, crossed mountains, dug tunnels and laid track. 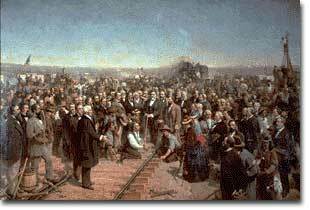 The two railroads met at Promontory, Utah, on May 10, 1869, and drove a last, golden spike into the completed railway. Fuel your passion for model trains and railroads. Watch free train videos filmed by railfans like you at the premier online train video resource. Videos of trains include freight trains, steam trains, coal trains and other railroading videos. The B & O Railroad Museum is known as the "Birthplace of American Railroading." The B&O Railroad was the first chartered rail common carrier in American history, dating back to 1827. This website is not as impressive as the museum itself (l20 pieces of railroad rolling stock, 15,000 artifacts, and 5000 cubic feet of archival material) but it does offer an interesting history and images of historic locomotives. This brief history of early railroads, produced by the University of Virginia, offers several images of early "rolling stock" including a horse-pulled wagon and one powered by a sail. Tracing railroad development from the early 1800s to the 1840s, this page is a good resource for a time period often neglected by other railroad history sites. The discovery of gold in California lured Chinese as well as Easterners to the hills of California. When reality fell short of promise, the immigrants turned to employment on the railroads. This fact-filled and easy-to-read essay contrasts the experiences of Chinese immigrants to Arizona with the experiences of those who lived in California. This website is like a scrapbook history of railroads. Tons and tons of pictures with complete descriptions fill the pages of this presentation. From the founding of the Central Pacific Railroad line to the completion of the Transcontinental Railroad, this website has clear 1800s photographs, documents, and records of every aspect of railroad history. Filled with biographies and historical accounts, this is a treasure for anyone students doing reports, preparing visual presentations, or just looking for somewhere to kill a few hours on the Web. Trace the history of America's growth West with these railroad maps from the 1800s provided by the Library of Congress. The easiest way to search the collection is by geographic location, but before you dive right in, don't miss the page entitled, "History of Railroads and Maps" to see the Library's take on Westward Expansion and the rise of the rails. Locomotives were once considered novelty items, impractical in the face of waterway travel. 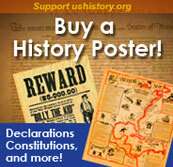 20,000 men put in nearly 240,000 man hours to build the first transcontinental railroad. May God continue the unity of our Country as this Railroad unites the two great Oceans of the world. -engraved on the golden last spike driven into the Transcontinental Railroad.